the Kings Athletic Department’s Fall Signing Day on Wednesday, November 14 at Kings High School. Families, coaches, teachers, administrators, and teammates attended the signing event to witness these ten student-athletes sign their letters of intent. Not only were these students great on the field, but they were also impressive in the classroom with a cumulative grade point average of 3.87! Below is the list of athletes, sports and schools they are attending. 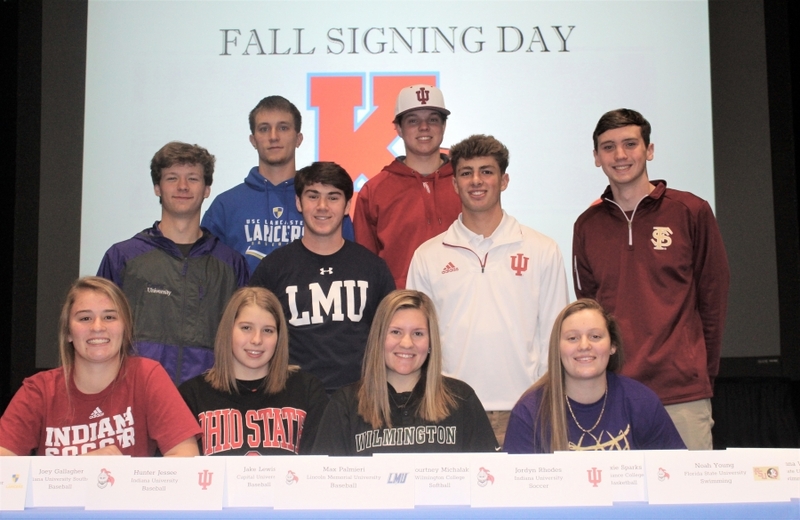 Jordyn Rhodes — Indiana University (Soccer), Brynna Wolfe – The Ohio State University (Swimming), Courtney Michalak — Wilmington College (Softball), Lexie Sparks — Defiance College (Basketball), Jake Lewis — Capital University (Baseball), Max Palmieri — Lincoln Memoria lUniversity (Baseball), Hunter Jessee — Indiana University (Baseball), Noah Young – Florida State University (Swimming), Brenten Baker – University of South Carolina-Lancaster (Baseball), and Joey Gallagher –Indiana University-Southeast (Baseball).